After putting up some retro adverts from Amiga Action I thought I’d have a good look through my favourite Amiga magazine from back in the day, Amiga Power, and do the same here! One thing I noticed about the Amiga Action adverts is how many of those games I didn’t actually own, even though I read the magazine and remember seeing the adverts for them. Whilst flicking through Amiga Power I noticed most of the games adverts were either of games I own, or had at least played… is this a coincidence? I just happened to buy and play games because they were in my favourite magazine? Certainly raises a few questions about the power of advertising! 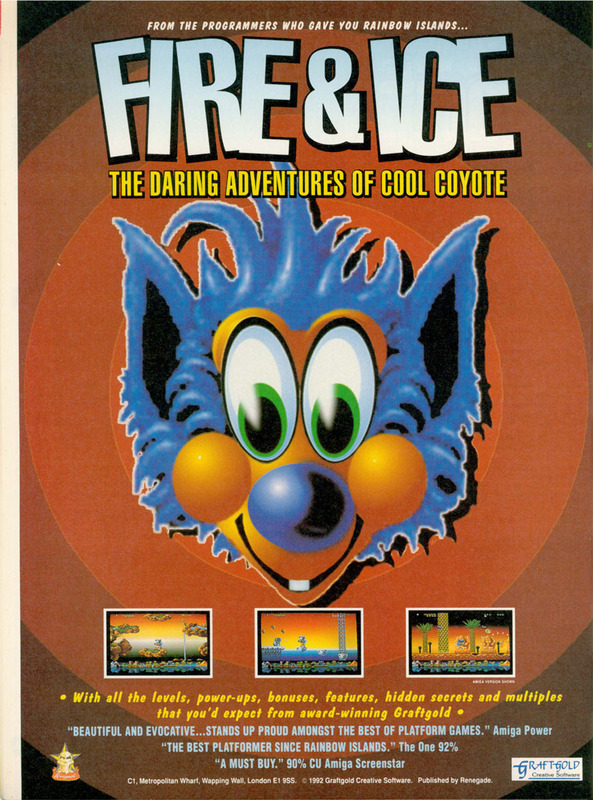 Either way, I was happy to be influenced to buy and play some of these games in the adverts below, I remember every single advert here and own most of the games, one of my favourites (see above) is Fire and Ice, it’s a great advert with a great illustration of the hero cool coyote. A few of my other favourites from the list include; Moonstone (more for the game than the advert), Premiere, the manic Wizkid and the weird and wonderful advert for Harlequin, which, like Premiere, was also the box art for the game. These adverts had a distinct influence on the games I bought, alongside the usual previews, reviews and word of mouth. Hope you see a few adverts you remember and that they spark similar memories, it would be great to know which adverts you remember from gaming magazines back in the day, Amiga Power was certainly my favourite Amiga magazine and has clearly been an influence on my Amiga gaming choices and collection. Amiga Power was definitely my favourite Amiga magazine on the market, it was funny, informative and had a really informal tone which I think made it the most appealing out of all the Amiga mags available. A few of my favourite writers were Dave Golder, who now works on the awesome SFX Magazine (follow him here on twitter), Stuart Campbell and Jonathan Davies. Please also visit Amiga Magazine Rack for more Amiga magazines and adverts! Couple of bonus pics I’ve found which can be seen in the gallery above (last two pics)! The Amiga Power team in all their glory, and my entry in The Last Resort section of the mag, asking for help on the game Simon the Sorcerer, this is before you could look things up on the internet. Natch. Thanks to Rich Pelley for answering my question.